My plants are limp and looking sick. They were just planted a week ago. Because your zucchini was recently planted, two thoughts immediately came to mind: cut worms or overwatering. 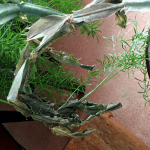 Check the base of your plants for damage. If there is none, you might be overwatering. Its a fault all gardeners are guilty of at one time or another. A plant looks a litle wilty and we immediately water it. Still wilty? We water it again. If neithher of these is the answer, it might ust be transplant shock from greenhouse to garden.